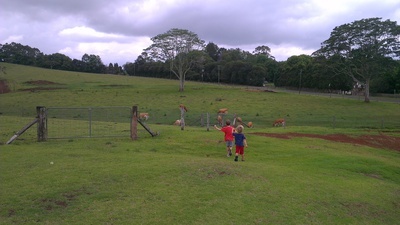 City kids can be a bit removed from where their food actually comes from so my I jumped at the chance to bring my kids on a tour at Maleny Dairy. This family owned dairy is nestled in the lush surroundings of the Blackall Range, just a short 1.15 hour drive north of Brisbane. The 1.5 hour tour starts with a meet and greet with one of the Guernsey cows where the tour guide shows you how cows are milked by hand. If you are up for it you can even get a sample taste test of milk straight from the udder. My kids were fascinated but opted to just give the cow a pat and brush. 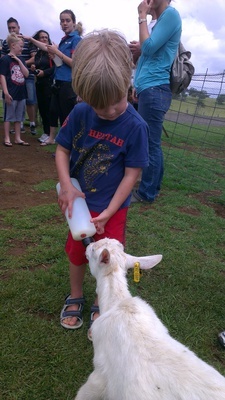 Next, you get to meet the baby calves, goats and chickens. We've always visited the baby petting zoos at fairs and fetes but seeing the babies on a farm and hand feeding them from a bottle was a great experience. Maleny Dairy has its own on-site milk processing factory so the tour includes a visit into the pit of the dairy to see how the cows and goats are milked and how the milk is stored. As we moved through the tour we were joined by a few goats, including a big smelly billy goat. Now my boys know exactly what I mean when I tell them they smell like billy goats before their bath! 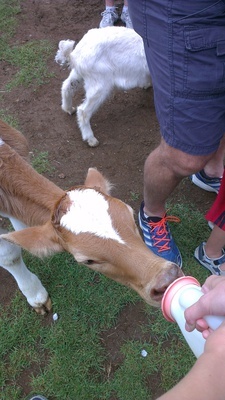 The tour then moves to the factory where the milk is tested, processed , bottled and stored. You get to see the machines used for processing the milk and learn about the pasteurisation and homogenisation processes (big, fun words for a 7 year old to learn!). You get to watch a short, "movie" DVD which recaps the process of getting milk from cow to cup. The tour ends with one of the highlights- the taste test. Maleny Dairy milk and dairy products have won several awards and once you try it you can see why. The strawberry yoghurt is the best I have ever had and our friends raved about the custard we brought back home. You can buy products directly at the dairy and there is also a kiosk that sells light lunches, tea and coffee. I highly recommend the scones with fresh Maleny Dairy cream. For all the details, visit the Maleny Dairy website. Tours operate daily at 10.30am and 2.30pm. Tours cost $9 per person (over 2 years of age). Tours are easily accessible by people of all ages. I would recommend old, enclosed shoes as there are lots of animals and the ground can get a bit dirty. Why? Get connected with your food! That must've been an incredible experience for your kids. l enjoyed reading it; felt like I was there. Thanks! I have done this tour a few times with my kids, 12 and 5, and it is absolutly great.